These Best Companies to Work For are using Facebook, LinkedIn, Twitter and other social media to get even better. The longtime face of Marriott International, Bill Marriott, has operated a blog since 2007, and the company uses mainstream social media such as Facebook and Twitter extensively -- Marriott says it leads the hospitality industry in Twitter followers and is on pace to make it to the top in Facebook "likes" soon -- but the company ventures into new ground with its My Marriott Hotel social game. 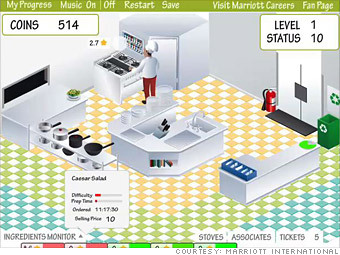 The game allows users to manage different elements of a Marriott hotel. Even with languages such as Arabic and Mandarin supported, it might come as a surprise that the city with the most players is Cairo, according to the company. Associates can post ideas for corporate changes to the "Did You Think of This" internal website, and several hundred entered a video contest submission through Marriott's jobs and careers pages on Facebook. The company also periodically has its officers hold question and answers sessions online, such as a human resources executive providing insight into the job search.